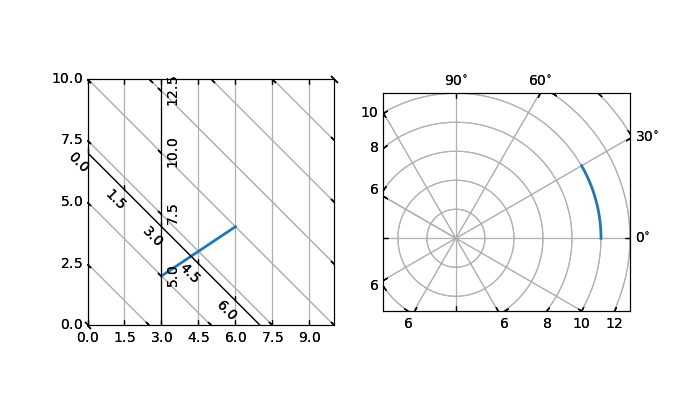 This example demonstrates how to use GridHelperCurveLinear to define custom grids and ticklines by applying a transformation on the grid. This can be used, as showcase on the second plot, to create polar projections in a rectangular box. polar projection, but in a rectangular box. # (min, max of the coordinate within the view). # Formatter here (but may be possible in the future). # make ticklabels of right and top axis visible. # Anything you draw in ax2 will match the ticks and grids of ax1.